Freightliner has waded back into the short-bonneted conventional market with the Australian release of the new Coronado 114. The 114 inch (2895mm) bumper to back of cab Coronado will help fill the gap left in Daimler's Australian model line-up after the demise of the Sterling brand. The new model puts Freightliner back in the running for axle-forward tipper and dog applications as well as 19 metre B-double roles - areas of the market where Kenworth, Mack and Western Star sales have recently been strong with their popular T409SAR, Trident and 4800FX models. This gives Freightliner a model capable of vocational roles as well as 26 metre linehaul B-double, and road train roles with a gross combination mass of up to 106 tonnes. The new Coronado retains the aluminium cab construction of its stablemates and is available in day cab and integrated sleeper form with 34 inch and 58 inch high-rise options. The Cummins ISX is not an option on the 114 model, with power provided by Detroit's 15-litre DD15 engine which, in the 114, will cover horsepower ratings from 354kW (475hp) through to 418kW (560hp) and torque from 2238Nm to 2508Nm. As for the transmission, the Coronado will rely on the Eaton manual and Ultra Shift AMT while Meritor diffs and a choice of air bag or six-rod rear suspension round off the driveline. 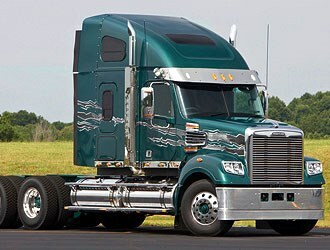 The truck also retains the cooling package of its larger sibling, the Coronado 224. This means that the radiator is mounted to the engine as one unit allowing the engine fan and shroud to be close mounted, maximising cooling efficiency. The truck also retains the distinct twin-steering box system found on the bigger 224.